Update: Read a report about what happened at this meeting on page 7 of the March edition of the St George & Redfield Voice. The St George Community Planning Group is organising a public meeting to give an update on our work over the past few months. This will include sharing the ideas of some students from UWE that we have been working with for improvements to the park and asking you for your views. There will also be an update from Cllr Asher Craig on the plans for toilets and for the café in the park which are to be funded by ‘Community Infrastructure Levy’ (CIL). This money was allocated by our local Councillors via the Area Committee following our meetings last year. This meeting will also start the process of allocating money for this year, so if you have ideas for projects that you would like to be funded there will be a chance to have your say. The Police will also be at the meeting to talk about the incidents of crime and anti-social behaviour that occured in the park last year and to update us on the situation in St George in general. There will also be brief updates from local Councillors on the issues they have been addressing. We held a meeting in St George Community Centre on Wed 15th August 2018 to discuss the development of a Community Plan for St George and a permanent solution for toilets in St George Park. This is an opportunity for residents to work together to transform key local assets including St George Park, St George Community Centre, The Lake, Toilets, Library, community housing and more (photo, SG&R Voice). The meeting, which was jointly organised with Cllr Asher Craig, was very well attended and there were some very constructive discussions. The meeting was attended by all of our four local Councillors, as well as our MP, Kerry McCarthy. The need for a Community Plan – there are a number of community facilities in and around St George Park that need investment, there are options to raise funding through grants but there needs to be an overall plan to ensure that the different projects aren’t competing with each other – for example the library could be redeveloped as a community hub which could include a café, but is it better to create a new café building in the centre of the park with toilets and a community space similar to that at Page Park? This would be a Community Plan, it will need members of the community to lead it and to ensure it keeps moving forward. 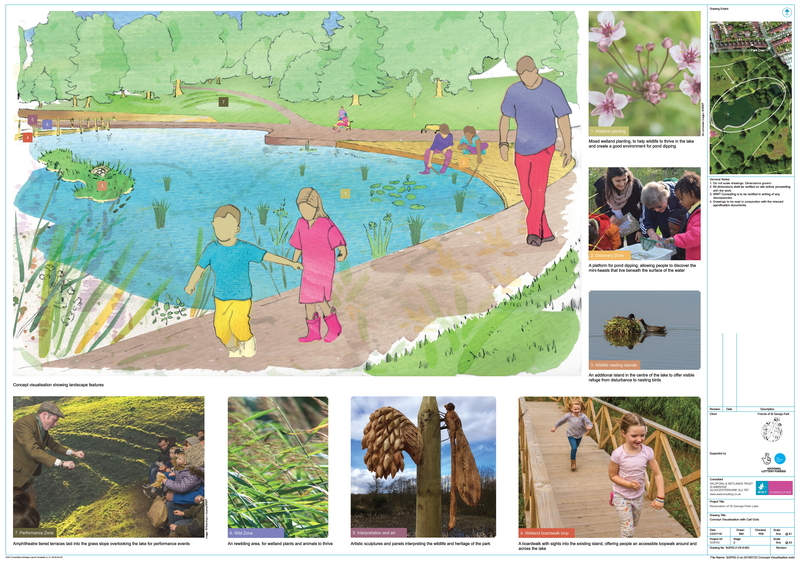 Projects to be considered – St George Park Lake; St George Park Buildings (incl bowls / tennis pavilion); St George Park Play Area; St George Library; St George Community Centre. It would also be necessary to consider community facilities in the wider area such as Meadow Vale Community Centre and the pavilion at Dundridge Park. Time-line – there would need to be extensive public consultation before plans could be drawn up and grants applied for. A business plan would need to be developed to ensure the long-term funding for the maintenance of any new buildings and planning permission might be required. 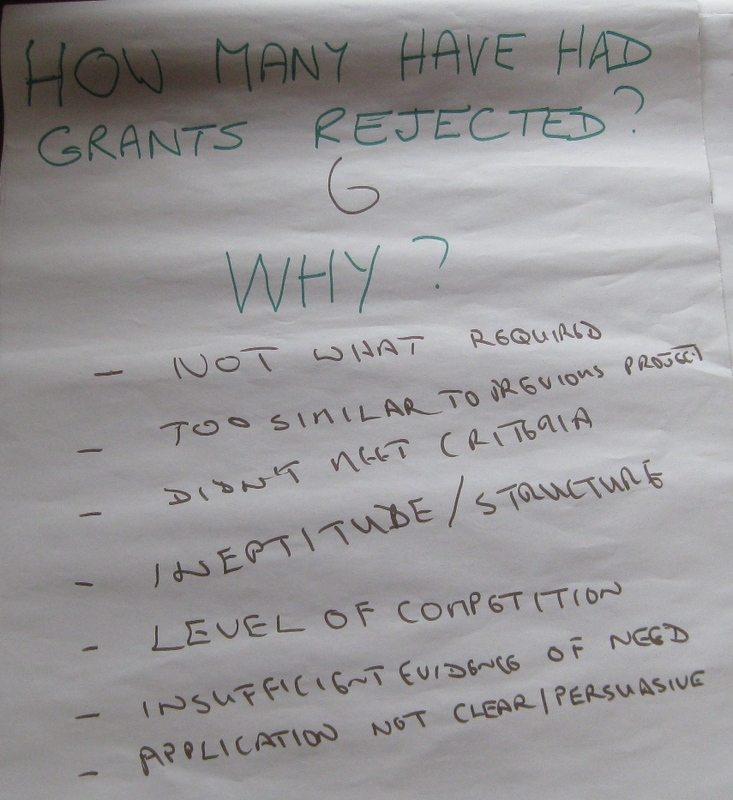 Large grant applications are often a two stage process. It is likely to be at least three years before building could start, five years would be an ambitious target for completion. Existing Temporary Park Toilets – Cllr Asher Craig to work with Friends of St George Park to apply for funding to extend hire until November. Toilet provision after November – it was agreed that the best solution would be to use Community Infrastructure Levy (CIL) funding to provide toilet provision in one of the existing buildings in the centre of the park while a long-term solution was developed. The four St George Councillors (who were all at the meeting) would aim to secure this funding for this at the Area Committee meeting in September. Further work would be done led by Cllr Asher Craig to look at options for paying for the cleaning and other maintenance required for the toilets, options include low impact advertising, inclusion in the café kiosk franchise, 20p charge for use. St George Park Lake – the ideas developed by the Wildlife & Wetlands Trust for Friends of St George Park can be seen below. These are provisional plans and a more detailed report is now being produced. Any project would need to consider the long-term maintenance of both the structures and the wildlife areas. Click on images to view. We will be arranging a first meeting of the Community Planning Group in late September, please let us know if you would like to be added to the list of those interested in joining the group. We had a good turn-out with around 25 people in St George Library for our latest Networking Meeting. The meeting came the day after Bristol’s Mayor, Marvin Rees, had announced that St George Library along with the 26 others in the City would be remaining open. These proposals are to be discussed by Cabinet on Tuesday 3rd July. Cllr Asher Craig spoke about this and the need for communty involvement in considering the long-term future of the building at the meeting. Cllr Craig also confirmed that it is intended to install a temporary toilet in St George Park near the café kiosk and play area in time for the summer school holidays. The meeting heard about the work of the SGCN Topic Groups and in particular St George Breathing Better and their plans for the following day – Clean Air Day. You can keep up to date with St George Breathing Better by joining thier Facebook Group. 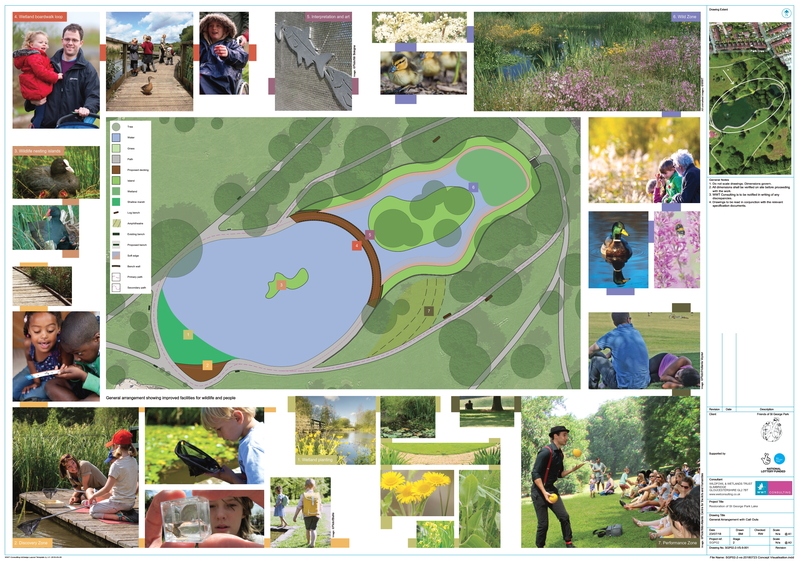 We then discussed further the options for the various projects that have been sugested and in particular those around St George Parks, more details of these can be seen on our Projects page which has been update following the meeting. We are still aiming to set up a Community Planning Group to drive the process forward, please email network@stgeorgecommunity.org.uk if you would like to get involved. The meeting also formed the AGM of the St George Community Network, Rob Acton-Campbell was re-elected as Chair and all of last year’s working group agreed to continue and were also re-elected. In addition Maria Needs and Pam Wade agreed to join the Working Group. One piece of news that we were able to pass on was that St George Community Fair (postponed in March when the ‘Beast from the East’ hit us), will now be held at St Aidan’s Church and Hall on Saturday 6th October (11.00 – 2.00). Also don’t forget that Redfest is back in St George Park this year on Saturday 4th August – redfestbristol.co.uk. Please do check out our Community Page for details of groups and organisations working in the St George area and let us know of anything that should be added or updated. The next St George Community Network meeting will be on Wednesday 20th June at St George Library at 7.30pm. As well as a chance to meet and talk to members of community groups throughout St George this will be a chance to continue our discussions on the various projects that were covered at our meeting in March. The intention is to form a Community Planning Task & Finish Group, to work with the St George Councillors and others to firm up proposals and look at options for funding. Cllr Asher Craig will also be there to give an update on the options for reinstating toilet facilities in St George Park for the summer as well as possible long-term solutions. It is now 12 months since the SGCN formally came into existence, so this meeting will also be our AGM – but please don’t let that put you off, the formal part of the meeting will be kept very short. If you would like to volunteer to join the SGCN working group to help run the organisation please let us know at the meeting or email network@stgeorgecommunity.org.uk to find out more about what is involved. Update 17th March: See our Projects Page for the outcome of the meeting. St George Councillors are asking for suggestions for allocating Community Infrastructure Levy (CIL) money to projects in St George. Influencing the way these funds is spent is one of the most important roles of the St George Community Network and we are going to focus on this at our next Networking Meeting which will be held on Wednesday 14th March at 7pm at St George Community Centre, Church Rd. The meeting is aimed particularly at community groups and organisations working in St George but all interested residents are welcome. The meeting will update you on what the Network and other groups have been doing, including our Topic Groups and there will also be a chance to meet and talk to those running the groups. The main part of the meeting will be asking how you think the money available from CIL should be spent in St George. So please come along with your ideas. Projects could be improvements in parks, to community buildings or other public assets. We are particularly interested in projects where work can start within 12 months but longer term projects that get community support could be held over to apply for funding next year. Highways schemes are being treated separately because of the long time it takes to get them started. If you are unable to come to the meeting but have an idea for a project you would like to see put forward then please email us. If you are new to the SGCN you can find out more about us on our website or on Facebook and Twitter. 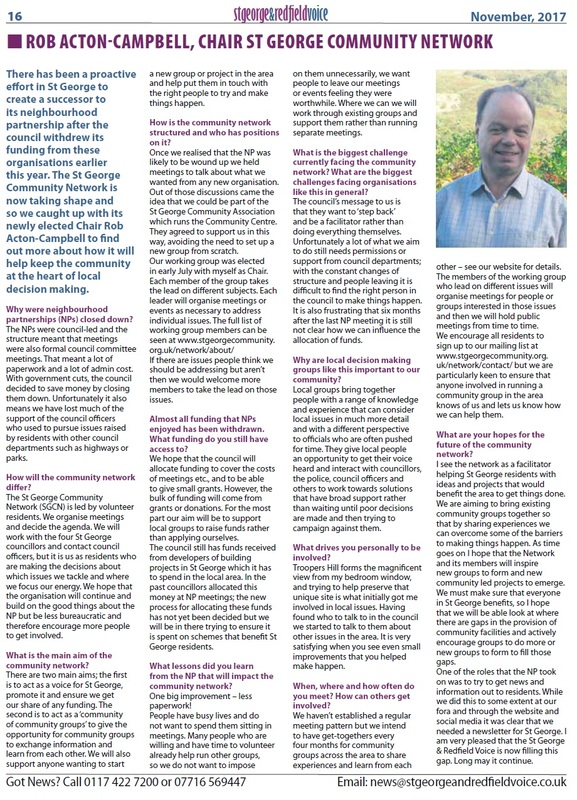 Page 16 of the November issue of St George & Redfield Voice has an excellent full page article about the SGCN. The St George Community Network’s Working Group currently has 8 members each looking at different issues in the area. More members are always welcome. Please contact us if you are interested. • Nigel invited anyone interested in influencing planning and development in St George to contact him. An invitation will be arriving in your mailbox soon. • Susan invited any groups who wanted to use the SGCN Facebook and Twitter pages to publicise their activities to contact her. Details of this offer will be sent to you soon. • Diane and Jo have the brief of walking, cycling, public transport and air quality. They spoke of the work they had done raising issues about air quality around Summerhill Academy and Summerhill Junior School. • Rob’s area of interest is parks and green spaces. A meeting will be held soon for local green spaces volunteer groups and anyone wishing to start such a group. Rob is looking to continue the success of local groups working together that has resulted in successful events and projects, including 3 new play areas. Jim Donaldson of St Aidan’s Church, announced that the St George Community Fair, the free event for all local groups to showcase what they do, will be held again on Saturday 3rd March, 2018 in St Aidan’s Church and Church Hall on Fir Tree Lane. Donations from any groups in the financial position to do so, would be very welcome. All donations will go to the Bourne Family Project which provides free support to families including adult counselling and play therapy in the St George and Kingswood area. Jim will be sending out invitations to all groups who have participated before. Any groups new to the event can email comms@stgeorgecommunity.org.uk for Jim’s contact details. The introductory part of the meeting helped everyone to know who they wanted to talk to in the networking part of the meeting. Just one of the pieces of information shared was about the start of a new arts project “Be Creative” starting in St George with a partnership between existing local groups and expertise formerly based at the Pip n Jay church. The topic for this meeting was grants. 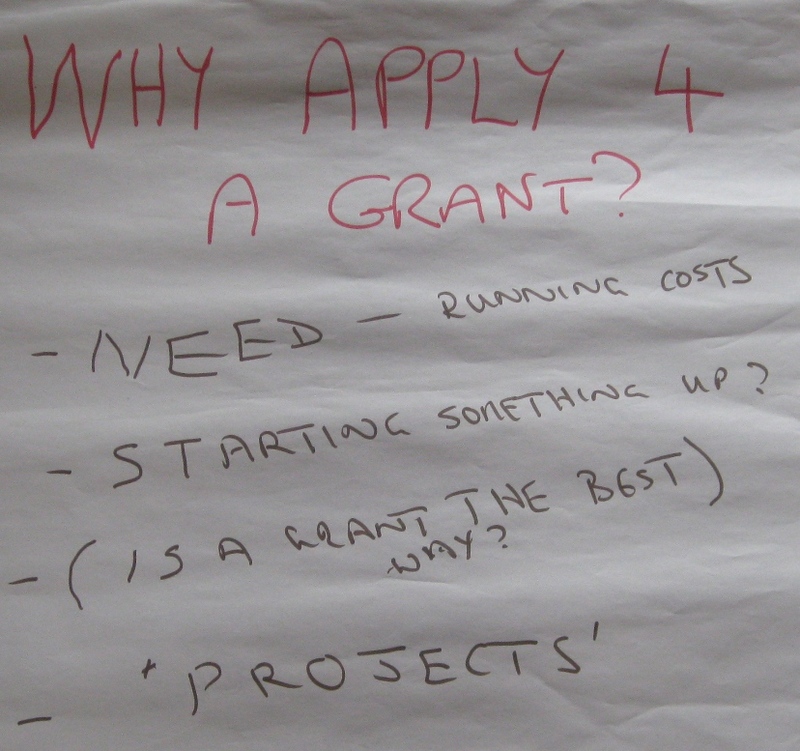 • where to find grants. 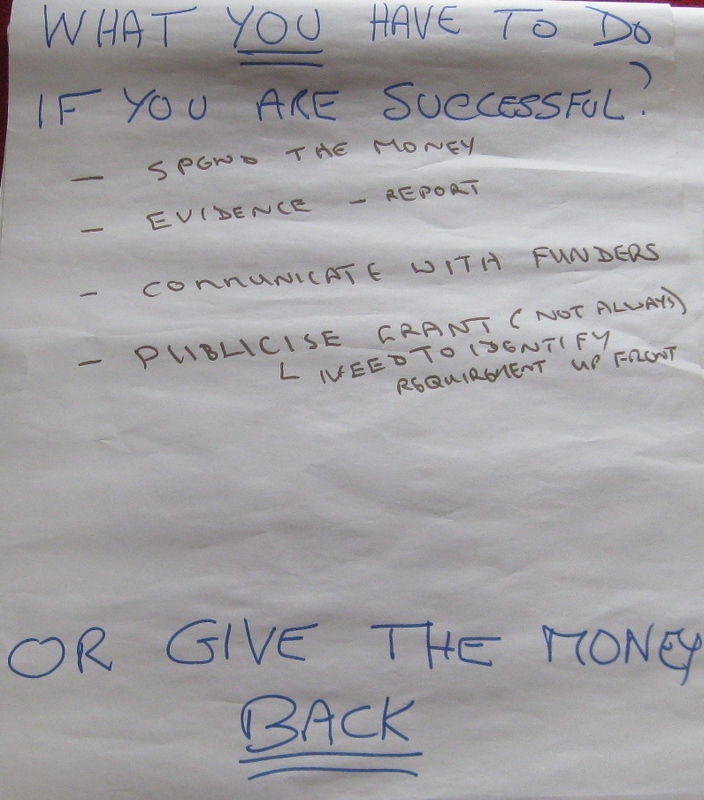 With 5 groups in the room who had applied for more than 4 grants, 5 who had applied between 1 and 4 times and two groups who had never applied for a grant this made for a lively and informative 30 minute session with Nigel wielding the pen and Susan encouraging the discussion..
What 30 minute topic do you want at the next meeting? – how to increase involvement in the SGCN and other groups across our diverse community. What would you like the topic to be? Would you be willing to run the session on this topic? Email comms@stgeorgecommunity.org.uk with your ideas. We will be setting the date for our next meeting soon. Look out for posters in local noticeboards, emails from us, check our website, follow us on Facebook and Twitter. A huge thank you Nigel and Maxine for making the studio of Black Iris Images available for this meeting. The St George Community Network working group met last week to finalise the details of the meeing we are organising on Wednesday 1st November. 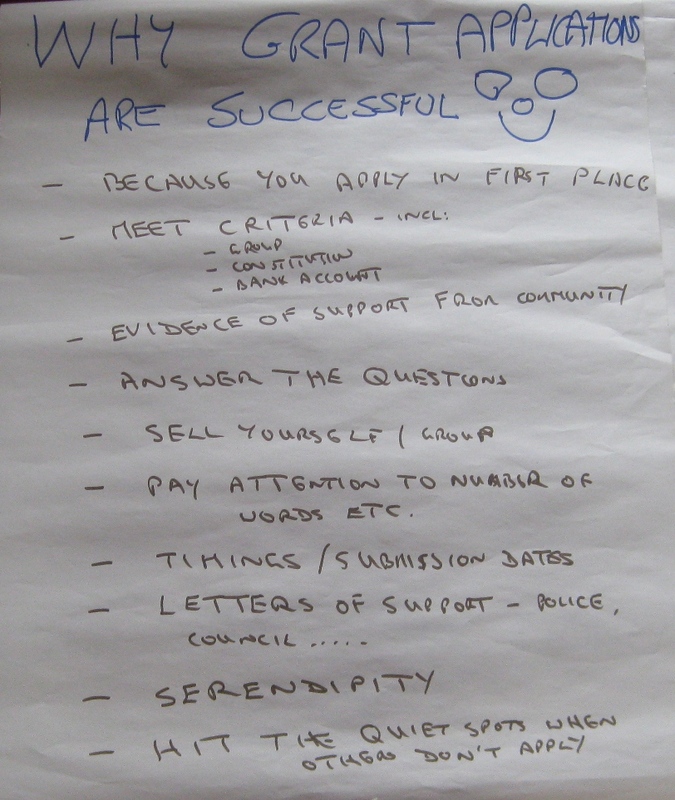 One of the aspects of the old Neighbourhood Partnership that people most liked was the opportunity for community groups across the area to get together to share experiences and learn from each other. We are aiming to hold get togethers every four months or so to allow this to happen. The focus of our first meeting will be on discussing grants that are available to community groups and sharing the experience of those who have applied in the past; both those that have succeeded and those that haven’t. There will also be ample opportunity for general networking and discussions of other subjects. While this is not a public meeting, it is open to everyone in the area who is either part of a community group or who is interested in starting one. The meeting will be from 7.30 to 9.00pm at The Old Hauliers Arms, Pile Marsh BS5 9NT, a poster advertising the event is shown below and will soon appear on the various notice boards around the area. Please spread the word to anyone who you think might be interested. We will soon be adding information to this website about community groups in St George with links to their websites and social media accounts. Please let us know if you would like any information added. We have set the website up on WordPress so that we can also give access to local groups to post their own appeals and information as news items. If you would be interested in doing this please let us know. We will also post information from city wide groups, the Council, the Police etc where it is relevant to St George. In the meantime here some links to current appeals for help. Please share if you have access to social media accounts. Church Road Lantern Parade is featured in the latest round of the Tesco Bags of help scheme. They are hoping to schedule a parade for November 29th 2017 and need your help to achieve this. When you visit any TESCO store in Bristol East please ask for a free token to pop in a box to help decide which project should win the first prize of £4,000 from the Tesco bags of help scheme. It is in all stores from The Island of Tesco at Eastville all the way up to Staple Hill, Hanham and Kingswood so way off our normal patch. Their target is £12000 to create a safe parade and this will give us a massive step up. Friends of Troopers Hill are running a consultation to see if there is support for a project to improve access to the Hill and ensure that it is protected from unwanted access such as by motorcycles in the future. Paper copies have been distruibuted locally, but you can also respond on line at www.troopers-hill.org.uk/waystonature. The closing date is 12th July, so there are only a few days left. If there is sufficient local support then Friends of Troopers Hill will apply for grant funding for the work. Two city wide organisations currently have petitions on the Council website that you may wish to support. The Bristol Parks Forum (of which Friends of St George Park, Friends of Dundridge Park and Friends of Troopers Hill are all members) is concerned about the Council’s current published budget proposals showing that they will stop funding our parks from April 2019, relying instead on revenue generated from parks events and other outside sources. Pavement parking has been a concern for many people in St George, and the Traffic and Transport group of the Neighbourhood Partnership had looked at how this could be tackled. The Bristol Walking Alliance has progressed on this issue, and has now created a petition.